In many ways, that’s the most telling line in Dutch author Cees Nooteboom’s new work, “Roads to Berlin,” for in this book, he does just that. 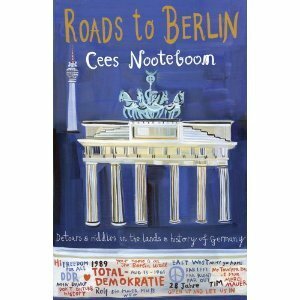 “Roads to Berlin” is a collection of essays from three of Nooteboom’s extended stays in Germany, at the end of the 1980’s, 1990’s, and 2000’s, respectively, plus some additional observations since then. The first section is devoted to his extended stay in Berlin, from early 1989 through June, 1990. This, of course, was the period when The Berlin Wall came down, and Germany began the long process of reunification. It’s nearly inconceivable to read his account of Checkpoint Charlie, and the arduous security checks one endured to get from West Berlin to East Berlin. In one placid river along the border, there were actually signs in the middle of the water, advising that THIS was the border, and you’d damned well not cross it. The East German Guard towers could see you if you did, and cars patrolled the other side. His late 1990’s visits find the former East Berlin seeming to spring forth from the earth. Construction is rampant, with huge cranes erecting huger buildings. Ten years later, in 2009, Berlin is nearly unrecognizable with all the new skyscrapers, and there is an entire generation of young adults who grew up without the wall looming over them. That’s really the crux of this remarkable collection: the transition from a divided Berlin to just plain Berlin. How did this change affect the rest of Germany? We find these answers here, too. Many of these essays focus specifically on Berlin’s metamorphoses, but others recount his forays deep along Germany’s roads less traveled. He visits small villages with unpaved roads, towns essentially unaffected by the big events in the east. As Nooteboom puts it, Germany is really a collection of several different countries. Yes, they’re all part of Germany, but their citizens to an extent maintain their Bavarian or Prussian, etc, roots. Cees Nooteboom is Dutch, though he has travelled the world. He lived in Berlin for those three periods, and he spent a year living in Los Angeles; he passes the winter away in Spain. My point is that his views of Berlin are neither those of a native Berliner nor of a complete foreigner. This unique viewpoint allows us to see Berlin and its remarkable last quarter-century through the wizened eyes of a German citizen and the unjaded eyes of a world citizen. Nooteboom has a flair for language as well. His descriptions of both urban and pastoral scenes evoke clear pictures in a broad palette of color and shade; his visions of war-crumbled buildings make us wonder what Germany could have been had World War 2 never happened. Certainly, this book will appeal to history fans, as it gives first-hand accounts of modern German events. Travel aficionados should appreciate the well-narrated journeys down the various roads to and from Berlin. But “Roads to Berlin” should resonate with everyone who grew up during the Cold War. This book relates the demarcation not only of The Wall, but between the world we grew up in and the world our children and grandchildren will inherit. If only for its ability to straddle that line so eloquently, this book is a remarkable achievement.